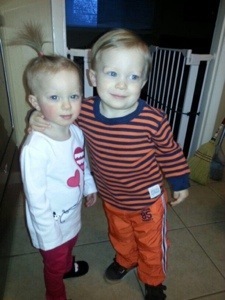 Today is our grand babies Ollie Bear & Livy Sue’s second birthday. It’s times like this that makes the distance between New Jersey and Ohio really stink! We can’t just get together whenever we’d like. I know for some families they may think that’s a good thing…but not us! We actually enjoy spending time together! We try to get together as much as possible. They were born prematurely which is not unusual for twins. Olivia was so tiny compared to her brother. However, they seem to have a bond that is adorable to watch. It was such an exciting time. Both our daughter-in-laws were expecting at the same time with their second pregnancies and due within a couple months of each other. It’s a time I will never forget. It so much fun and keeps us young, I dread the day they’ll all be in school.Pop Pop and Nana will have to go to the gym more. That’s what you think Pop Pop! Lol!